Last night, the HiRUM Networking Event was held at Norfolk Luxury Beachfront Apartments. 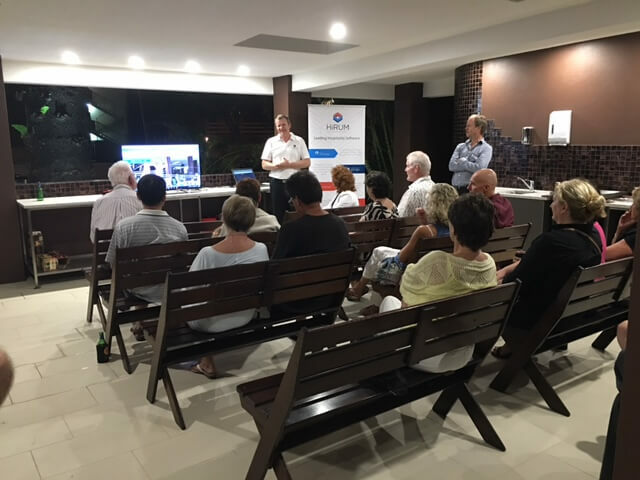 It was a lovely evening, which included presentations by Sylvia Johnston (HiRUM Software Solutions), Paul Gaffney and Geoffrey Stephens (DFK Crosbie), Michael and Brook (Norfolk Luxury Beachfront Apartments). Sylvia Johnston presented on the current state of the online travel industry. Sylvia discussed the increasing importance of direct bookings and what managers can do to drive direct bookings. She also discussed how HiRUM can help, through our complimentary consulting, variety of marketing services and Zbreaks. We also had the pleasure of inviting Paul Gaffney and Geoffrey Stephens from DFK Crosbie. DFK Crosbie is one of Australia’s leading providers of accountancy and business advice with over 50 years of experience offering caring and personal service to their clients. Paul and Geoffrey discussed the importance of transparency in the verification (due diligence) process. Our clients, Michael and Brook gave an overview of the complimentary consulting service they have received from us and how it has helped them. If you haven’t taken on the complimentary consulting support offer, email sales@hirum.com.au to book a consultation. For those who attended last night’s event, thank you. Also, from the team at HiRUM, thank you to Michael and Brook for allowing us to host our event at their property. If you would like to attend the next HiRUM Networking Event, stay tuned for details.